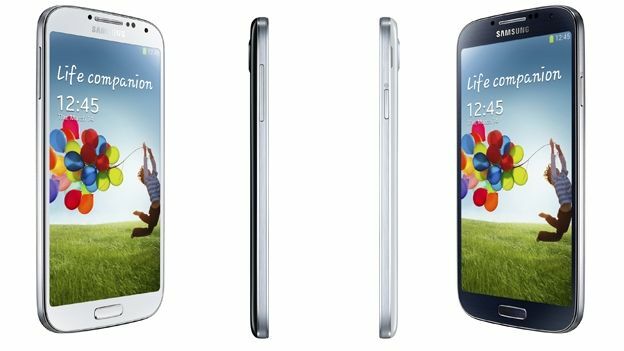 The Samsung Galaxy S4 has been unveiled in New York, but how has it improved over last year's critically acclaimed Samsung Galaxy S3? The time of reckoning is at hand, Androiders - Samsung's latest greatest smartphone the Galaxy S4 is here. Lets say that you're not interested in an Apple iPhone 5, and the Android credentials of the HTC One and Sony Xperia Z aren't doing anything for you either. The question is, should you ditch that old, tired looking Galaxy S3 for it's newer, shinier, bigger brother? We've layed out the facts and stats to compare the two. Should you swap your S3 for an S4? Lets take a look. The confusing colours of last year's Galaxy handset are gone, in favour of a more simple choice - black or white. The Galaxy S4 weighs in at 130 grams, and measures 136.6 x 69.8 x 7.9mm, making it a pretty large handset as things go, managing to pack a whole load of tech into a slimmer body. The exterior buttons are similarly positioned in comparison with the Galaxy S3, and the same polycarbonate has been used, so the build quality feels about the same as well. Available in 'Marble White', 'Pebble Blue' (pebble... blue?!) and 'Titanium Grey', the Galaxy S3 is all about the curvaceous body. It's more resemblant of the Samsung Galaxy Nexus than the Samsung Galaxy S2, both in size and contours. Although the plastic finish on the back feels more premium than its predecessor. Measuring 136.6 x 70.6 x 8.6mm, the S3 is a touch wider and fatter than it's younger brother, and it's comfort in the hand is rather a subjective issue. At 133g, the S3 is not particularly heavy given it's size, but it's a tad heavier (3g) than the 130g Galaxy S4. This is the bit that many have been waiting for - the Samsung Galaxy S4 has a 5-inch, full HD, super-AMOLED display that is more than a match for any of it's close rivals, and beats the S3s screen hands down. The pixel density is quite astonishing - an amazing 441ppi, which is the same as the Sony Xperia Z and a little less than the HTC One. As is usual with Samsung's super-AMOLED displays, there glare is minor, if not non-existant, and the viewing angles are extremely wide. Make no mistake, this is a very impressive display. The S3's enormous 4.8-inch HD Super AMOLED screen still looks and feels as enormous as it did a year ago. The maximum resolution of 720 x 1280 at 306 pixels per inch still looks good, but it's nowhere near the best display on the market anymore, and it is looking dated next to the latest competition from Apple, HTC, Nokia and Sony. That said, it's not like we're looking at a Nokia 3210 - a year is a long time in smartphone technology, but the S3's AMOLED display still holds up pretty well. The 13MP rear camera is capable of full HD 1080p video recording, and the front facing 2MP camera is an improvement on the S3's 1.9MP effort (though curiously, a return to the 2MP camera that the Samsung Galaxy S2 had on it's front). The new UI provides easy access to a variety of digital camera modes, such as; Dual Shot, which lets you take two photos and then merge them together; Drama Shot, which lets you take a series of burst photos and then merge them together; Sound Shot, which attaches a 9-second sound clip to a photo; and many more as well. Samsung has put a great deal of thought into their on-board camera functions. The Galaxy S3 has a reasonable but outdated 8MP/1080p camera - exactly the same as that on the HTC One X. In burst mode, the camera takes continuous shots at a rate of 6fps, then picks the best shot based on smile detection, blink detection, contrast and blurring. According to Samsung, the camera also has zero shutter lag along with an improved shot-to-shot time. You'll be able to set up rules for photos to be automatically placed in groups based on faces, contacts or location. There's also Face Zoom which means that you can tap on a face when lining up a crowd shot and the camera will zoom in automatically. The S4 is making a big splash with a monster Exynos 5, 1.6GHz octo-core CPU, propped up by a solid 2GB of RAM. Like the Galaxy S3, the S4 comes with 16GB of storage as standard, with options for 32GB and 64GB, and a Micro SD card slot for an additional 64GB. Samsung's quad-core 1.4GHz Exynos processor powers the Galaxy S3, and it's bolstered by 1GB RAM. There is barely any lag when switching between home screens and firing up apps. Flash memory is available in 16, 32 and 64 GB versions, and there's also a micro SD card slot should you wish to expand the memory. The S4 will ship with Android 4.2.2 Jelly Bean, and includes many of Samsung's own editions. These include; S Translator, which translates speech and text automatically in emails and text messages; Air Gesture, which lets users navigate the phone via hand gestures; S Health, a total health and fitness tracker that includes a pedometer, and a food planner and tracker; and Smart Stay/Smart Pause, which automatically pauses your screen when you look away from it. Samsung hasn't removed anything, simply added to it with more innovative (if potentially niche) features. It's worth mentioning that the S4 also has a massive range of other tech packed in, including an accelerometer, barometer, temperature and humidity sensors, digital compass and an IR LED to use the handset as a remote control. The Galaxy S3 comes with Android 4.0 Ice Cream Sandwich as standard, but can be updated to Android 4.1.2 Jelly Bean at the present time. Samsung's Touch Wiz UI is an easy-to-use, streamlined OS overlay, but still retains a wealth of features. S Voice is essentially voice-activated control that gives you direct access to functions such as the camera, calls, text messaging, alarms, weather, calendar and music and it'll even work when music is playing. What it won't do is answer you back with pithy retorts, like Apple's Siri. The S4 packs a 2600mAH battery. Samsung claims this is big enough, but given the wealth of features and functions in the S4, we're not sure how long the battery will last. Stay tuned for a full review where we can test this out. The Galaxy S3's 2100mAH battery is hefty enough to handle all the tech that has been packed into the S3. A bigger battery doesn't always mean longer battery life though, and a year's worth of operating system updates have left the S3 lacking slightly in this department.